"The only thing that stops a bad guy with a gun is a good guy with a gun," says Wayne LaPierre, NRA's executive vice president. 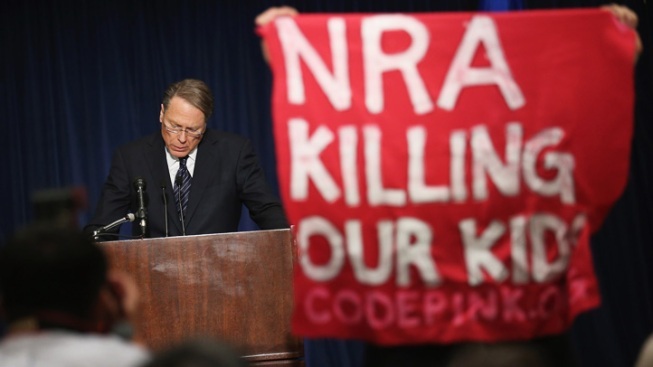 A demonstrator from CodePink holds up a banner as National Rifle Association Executive Vice President Wayne LaPierre delivers remarks during a news conference at the Willard Hotel December 21, 2012 in Washington, DC. The nation's largest gun-rights lobby called Friday for armed police officers to be posted in every American school to stop the next killer "waiting in the wings." The National Rifle Association broke its silence Friday on last week's shooting rampage at a Connecticut elementary school that left 26 children and staff dead. "The only thing that stops a bad guy with a gun is a good guy with a gun," the group's top lobbyist, Executive Vice President Wayne LaPierre, said at a Washington news conference. For full U.S. news coverage, visit NBCNews.com. LaPierre said "the next Adam Lanza," the man responsible for last week's mayhem, is planning an attack on another school. "How many more copycats are waiting in the wings for their moment of fame from a national media machine that rewards them with wall-to-wall attention and a sense of identity that they crave, while provoking others to try to make their mark," LaPierre said. "A dozen more killers, a hundred more? How can we possibly even guess how many, given our nation's refusal to create an active national database of the mentally ill?" He blamed video games, movies and music videos for exposing children to a violent culture day in and day out. "In a race to the bottom, many conglomerates compete with one another to shock, violate, and offend every standard of civilized society, by bringing an even more toxic mix of reckless behavior and criminal cruelty right into our homes," LaPierre said. Will Newtown Prompt Gun Reform in Washington? LaPierre announced that former Rep. Asa Hutchison, R-Ark., will lead an NRA program that will develop a model security plan for schools that relies on armed volunteers. The 4.3 million-member NRA largely disappeared from public debate after the shootings in Newtown, Conn., choosing atypical silence as a strategy as the nation sought answers after the rampage. The NRA temporarily took down its Facebook page and kept quiet on Twitter. Two Democratic senators, who have introduced gun control legislation, blasted the NRA after the press conference. Since the slayings, President Barack Obama has demanded "real action, right now" against U.S. gun violence and called on the NRA to join the effort. Moving quickly after several congressional gun-rights supporters said they would consider new legislation to control firearms, the president said this week he wants proposals to reduce gun violence that he can take to Congress by January. Obama has already asked Congress to reinstate an assault weapons ban that expired in 2004 and pass legislation that would stop people from purchasing firearms from private sellers without a background check. 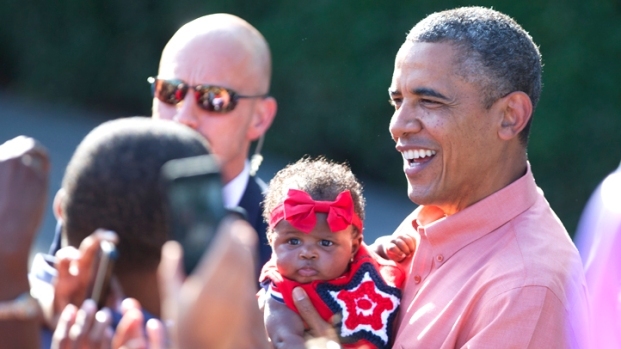 Obama also has indicated he wants Congress to pursue the possibility of limiting high-capacity magazines. On Friday, Obama said in a YouTube video he was encouragedby a “We the People” petition posted on the White House website calling for more gun control. "We hear you," he told signers of the petition, which has amassed 200,000 supporters in the wake of the Newtown school shootings. "I will do everything in my power as president to advance these efforts because if there's even one thing we can do as a country to protect our children, we have a responsibility to try."